Last week being only a four day week still seemed to move so slow. However, I felt like my students learned a lot and I'm really enjoying my classes. One thing that is working very well this year is not having binders. I can not stand binders, sixth graders just can not keep them organized and they usually just throw papers in a random place. I know many teachers say that we should be teaching them to stay organized but last year it was way too much of a battle. So this year I did away with binders and my students have a reading notebook and a social studies notebook. We keep them in the classroom and I don't even have to worry about them not being prepared. 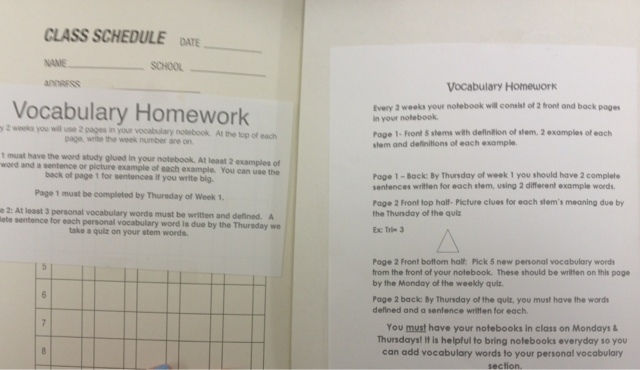 If I have a handout then I shrink it down a little so that it can fit onto the composition notebook and they glue it in. This has been working SO well and my students love being able to cut and glue more often. 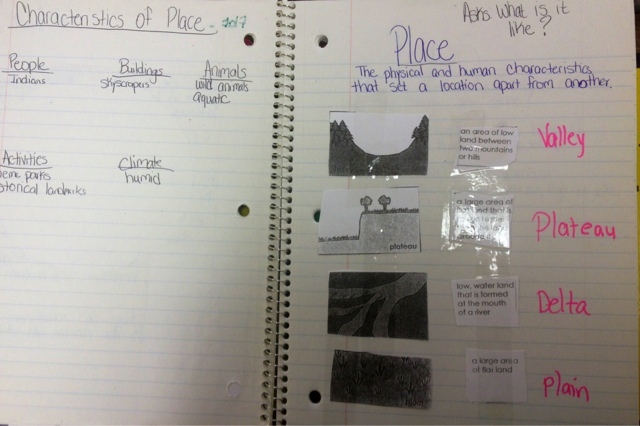 Here are a couple of pages from their social studies notebook. 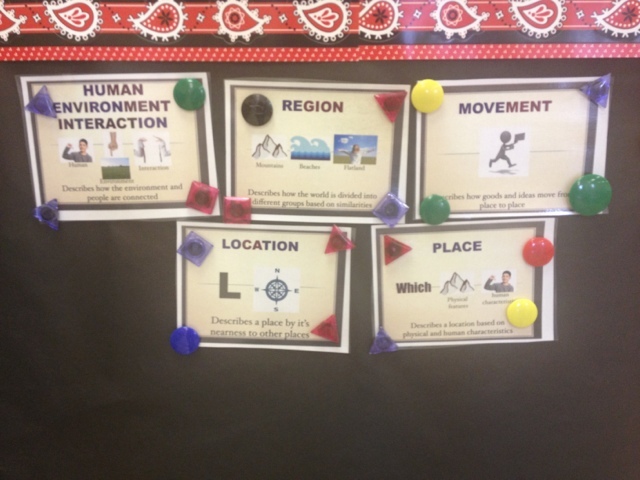 We have been working on the 5 themes of geography. 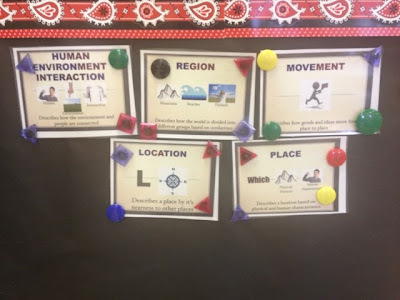 These are the power pics I created to help students remember the 5 themes. Power pictures are pictures that display a gesture we created in class to remember a vocabulary word. I review power pictures at the beginning of class. I also started vocabulary with them this week. Since I teach two completely different leveled classes I had to differentiate their homework. They keep their vocabulary in a notebook so that they can look back at past weeks without losing anything. 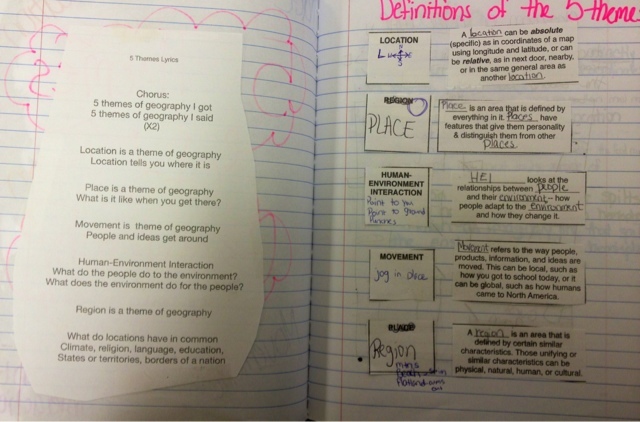 We work on greek and latin roots in sixth grade so their homework comes from learning the meaning of different stems. I also want my students to grow their own personal vocabulary so I have them look for words they don't know in their reading and record them in their vocabulary notebooks. Other happenings this week included multiple meetings and our first football game. I'm so proud of my cheerleaders for all of their hard work. They did a great job at our first game and they will only get better! Not only are they wonderful cheerleaders but they have big hearts as well. Here is us during our prayer circle before the game. Friday I stayed until almost 7:30 to get my room cleaned up. You would think with only being in school for two weeks that my room shouldn't be a mess yet. I had papers everywhere and my supply order came in this week so I had to find places to put everything. I left at the end of the day Friday feeling like a new person. 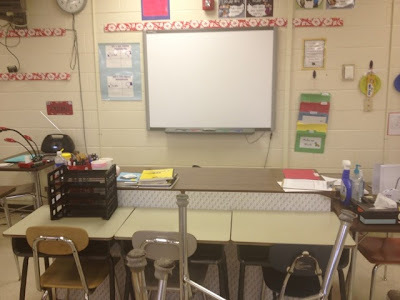 There is nothing better than being able to see to clean teacher desks.